The Sony GXD-L52H1 is a 52" LCD monitor specifically designed for digital signage. The display is ideal for a variety of applications, including retail stores, schools, public institutions, enterprise lobbies, and factories. The 1080p resolution combined with an extensive feature list ensures the GXD-L52H1 will perform exquisitely in almost any situation. The GXD-L52H1 is housed in a durable aluminum frame, capable of taking the daily abuse of public places. The LCD panel is protected with an anti-reflective coated piece of tempered glass which can be removed and replaced without having to take apart the entire display; in most cases without having to take the panel off it's perch! Very cool indeed. The GXD-L52H1 does not need ventilated areas to function properly. This is all possible by implementing a sophisticated cooling system which regulates heat within the panel itself. The panel can accept a series of card input modules which increase its input capability. Whether you need HD-SDI or HDMI, you can customize the panel for your specific needs. The monitor can display multiple video signals at once in a series of picture-in-picture and picture-and-picture modes. The GXD-L52H1 is extremely customizable. The GXD-L52H1 is capable of being used in an array for making video wall installations. Simply set multiple screens in a grid pattern, connect and go! This 52" Sony GXD-L52H1 Flat-Panel TV provides the user with a good viewing experience by delivering picture with fine details. The model features 1920 x 1080 pixels display resolution and an aspect ratio of 16:09. This Sony Flat-Panel TV offers HDTV definition with a native resolution of 1080p. About The Brand Sony is a Japan-based corporate group focused on the electronics, entertainment and financial service sectors. The company consists of various subsidiaries including Sony Computer Entertainment, Sony Music Entertainment, Sony Corporation and many more, as Sony Corporation is nowadays one of the leading manufacturers of electronic products for both the consumer and professional markets. Worldwide-known for its reliable, high-quality devices such as cameras, laptops, mobile phones and tablets, Sony is noted to be the third-largest manufacturer of televisions as well. In 2005 the company introduced its in-house brand BRAVIA which offers high-definition LCD TVs in a wide range of screen sizes. 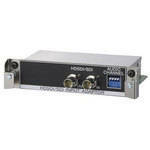 Box Dimensions (LxWxH) 55.1 x 14.1 x 36.7"
The Sony BKM-FW16 is an HD-SDI (Serial Digital Interface) input adapter module designed specifically for the GXDL52H1 full HD ruggedized LCD. Using HD-SDI allows users to get uncompressed digital video over familiar BNC cabling, providing the purest video signal possible.